Be the first to share your favorite memory, photo or story of J.M.. This memorial page is dedicated for family, friends and future generations to celebrate the life of their loved one. Goldsboro – J.M. 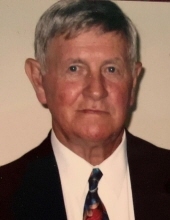 Merrill, 83, peacefully went to be with his Lord and Savior on Friday, March 15, 2019 at his home. J.M. was born in Magnolia, Mississippi on April 4, 1935 to the late Rush and Mattie Davis Merrill. He served his country in the United States Air Force. J.M. retired from Civil Service with 33 years of service at Seymour Johnson Air Force Base after which he worked at Wayne Memorial Hospital for 10 years. He then worked at Larson’s Transportation for a number of years. J.M. was a faithful member of Faith Free Will Baptist Church where he was a former deacon, department superintendent, Sunday school teacher and choir member. He assisted in starting a little league team and baseball field in Princeton, where he also coached. He had a great love for officiating football, basketball, baseball and softball. J.M. refereed several state championships and the highlight of his career was the 1990 North South Shrine Bowl Game in Charlotte, NC. His hobbies were playing golf and working in the yard. He loved his family and enjoyed singing very much. The family will receive friends on Monday, March 18, 2019 from 1:00 – 2:00 p.m. at Faith Free Will Baptist Church followed by a service to celebrate J.M.’s life at 2:00 p.m. in the sanctuary with Pastor Christian Powell officiating. Interment will be in Evergreen Memorial Cemetery with military honors. J.M. is survived by his wife of 60 years, Margaret W. Merrill; daughter and son-in-law, Debbie and Jerry Sandlin; grandchildren, Nikki Sandlin, Jeremy and Melonie Sandlin; great-grandchildren, Dallas, Holland and Tallon Sandlin; sister and brother-in-law, Patricia and Charlie Reneau and several nieces and nephews. In addition to his parents, he was preceded in death by his brothers and sisters, Junior Merrill, Christine Ledford, Pauline Vanderford, Frank Merrill, Jack Merrill, and Helen Robinson. A special thanks to Community Home Care and Hospice for all the help and care they provided. Also a special thanks to his special niece, Angel Woodard, for all of her help she gave during this time. In lieu of flowers memorials may be given to Faith F.W.B. Church, 1200 W. Grantham Street, Goldsboro, NC 27530. To send flowers or a remembrance gift to the family of J.M. Merrill, please visit our Tribute Store. "Email Address" would like to share the life celebration of J.M. Merrill. Click on the "link" to go to share a favorite memory or leave a condolence message for the family.